There are a few signs I look for now when I think Another Great IPA may be before me. There are obvious signs: anything too dark and malty-looking ushers a dark curtain of dread upon my soul. Also in the realm of first impressions, I've found that many of the best IPAs are hazy. There are probably a number of reasons for this, but in general, haziness could be an indication that an IPA is super fresh, dense with hop particles, and of course, unfiltered. Filtering removes flavor, and personally, I want every precious ounce of flavor. Kern River's Citra Double IPA has all those tell-tale signs, but most importantly of all: the aroma explodes out of the glass. And god, what an aroma it is: funky mango, peach, melon, bubblegum and tropical fruit, citrus and pine, and yes. Yes indeed. The only IPA I can think of with an aroma as fantastic as this is Heady Topper. While Kern River calls this beer "Citra Double IPA," it is not, as I originally thought, a Citra single hop IPA. Citra is brewed with both Citra hops and Amarillo hops (and less significantly, Nugget for bittering). And while the name may be slightly misleading, the beer is a staggeringly pure representation of those two hops: the funky mango and tropic thunder of Citra; the peachy sweet bubblegum of Amarillo, with all the nuances in between. 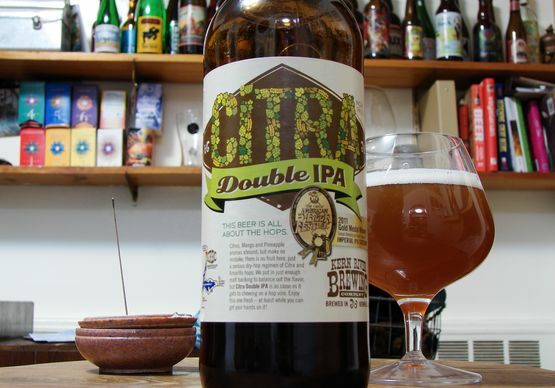 If you can conjure a mental vision of how those hops would taste in a totally pure, unflawed, unadulterated form, then you should have a good idea of how Citra Double IPA tastes, and why it's so damn good. It doesn't just capture those flavors — as a "very good, but not superb" IPA would do — it amplifies them to beautiful, majestic heights. (I find that the more I drink of this beer, the more purple my prose becomes in reviewing it). Bitterness is firm and clean, but doesn't get in the way, or mask any of the subtleties. Not that this beer is subtle, mind you; I'll take crushingly potent flavor over crushingly potent bitterness any day. Also of note: Citra DIPA is not as dry as many west coast IPAs. There's a creamy richness to it, which is enhanced by, and enhances, the fruitiness and sweet bubblegum character. (It's closer to Heady Topper than Pliney the Elder in many ways). Overall, this drinks as "balanced," though the flavors are entirely overboard and overwhelming hoppy. A nice achievement. Normally, I would warn readers to drink this as fresh as possible. But with a beer this highly sought after, I don't think that warning should be necessary — you probably don't have a bottle of this unless you waited in line for it, in which case, I doubt you're going to let it sit in your fridge for two months. I only got a bottle of this thanks to my extraordinarily generous and beer-committed friend Travis. Thanks Travis! Still, just in case: drink this immediately. Given its profile, I suspect that Citra DIPA would not hold up as long as other imperial IPAs. Availability: 22 ounce bottles. Released a couple of times a year. I was in San Diego a couple years ago and searched high and low... couldn't find it at all. One bar had had it, but the bartender had just consumed the last bottle. Sonofa! Yeah, I'm definitely curious to try the clone sometime, I think it would be awesome with Conan yeast too (already has a really similar character). Too bad Amarillo is so damn impossible to find and expensive these days. It was definitely lighter than this photo would indicate. IPAs always photograph darker for me than they really are, for some reason, plus this one was super hazy. I'd say it was maybe a 5-6 on the SRM scale. From what I hear this is insane to track down. Thankfully my friend lives close and is as obsessed with beer as I am. 5-6 SRM sounds about right. I'm definitely going to brew it again... if I can ever find Amarillo hops. I was lucky enough to finally get a pound each of Simcoe and Citra, which are about equally as tough to find. If I had any left I'd be happy to send you a bottle or two... if I can brew it again I'll let you know! Thanks man! Maybe we'll end up brewing it around the same time and can arrange a swap. That'd be fun. I did just look up Amarillo hops on Label Peelers, and they've got a pound for 22 bucks, which is not bad at all. Tempted to put in an order, but I think I've already maxed out my freezer space, and I've already got my brew schedule booked until about... September. Hah. Oh, homebrewing. Wow... that IS a good price. I hear ya. So many beers and styles to make, so little time. I often have my brew schedule decided months in advance as well... but of course it ends up changing on a frequent basis! Just checked. Sold out already! Holy crap, already? Damn. I just checked randomly, I probably should have bought them. I could definitely find a use for them soon. Forgot to update you: I was lucky enough to buy a pound of Amarillo from my LHBS (they got a limited supply in, but still sold me a lb), so I'll hopefully be tackling this clone again sometime soon! Nice! I got some Amarillo as well. I'm going to do a clone-ish beer in the fall but I think I'm going to add in some Galaxy in place of some (not all) of the Citra. Just go for the fruitiest possible IPA.